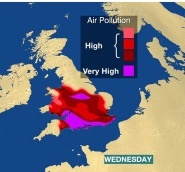 forecast– strong pollution, European emissions, Saharan dust and we’re warned not to exercise outside. So I should drive? But cars emit pollution. After last night’s ride, I intended to drive anyway. At least I know why the car is dirty so suddenly. later– we could smell the pollution. Well, maybe not, but we could sense it in some way. It was like the air near a demolition site, the smell of brick dust then. This entry was posted in Cycling, Health, Weather and tagged air pollution, Cycling, Weather. Bookmark the permalink.